(Nearly)-Mature-Male-20090528-2, originally uploaded by Paradise in Portugal. This was one species that took me by surprise. 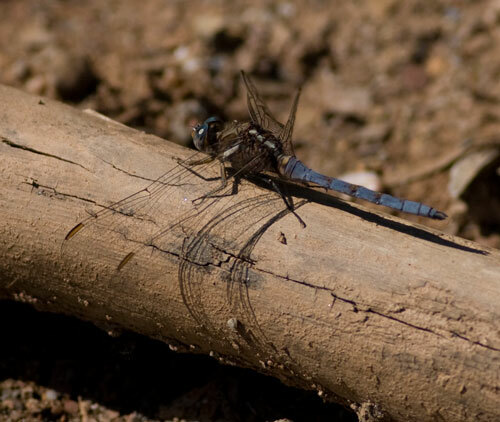 The Epaulet Skimmer’s main habitat is in north Africa, and though known in the Iberian Peninsula, I had no idea they’d be as abundant as they proved to be today. Every time we approached the water they seemed to be there, mostly, like the one pictured here, immature males – though this is so nearly mature it makes little difference. 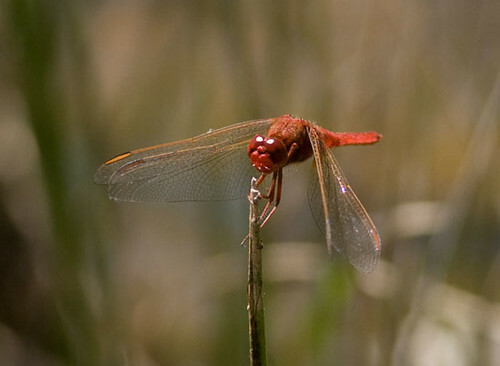 Mature-male-Scarlet-Darter-20090528, originally uploaded by Paradise in Portugal. 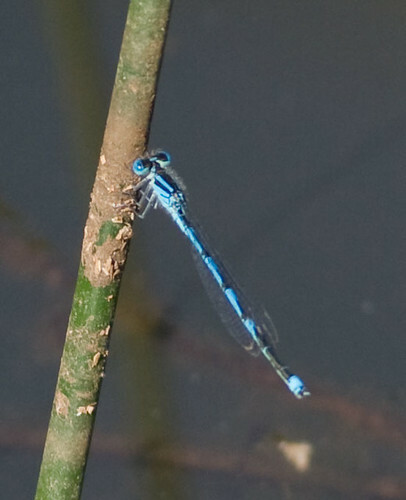 Male-Goblet-marked-damselfly-20090528, originally uploaded by Paradise in Portugal. I had with me a Dragonfly Specialist, (complete with net and inspection jar), so we had a fun time pottering around identifying the various species. The valley is broad-bottomed and the river meanders this way and that, sometimes between rocky outcrops, sometimes through shaded groves of alder and poplar, sometimes with deep pools, sometimes rustling and rushing over loose rocks, sometimes disappearing altogether only to appear again 50 mts later. Red-rumped-Swallow-20090507, originally uploaded by Paradise in Portugal. It seems ages since I wrote the last entry in this blog – it all goes to show that there’s no rest for the wicked I suppose! So what’s been happening? Well, the sun’s been shining and most days recently I seem to have been out there guiding and birding – and when I haven’t been doing that I’ve been trying to catch up with the paperwork that always goes on behind the scenes. Now I’m not going to bore anyone with the ins and outs of the paperwork, (which just seems to get more tedious, involved and threatening every day – the latest gem is a threat from our local authority to fine any business that doesn’t comply with the latest State grab for more money with a fine of two and a half million euros! ), as the photos below make up for all the days we have to spend doing it. They were all taken during the last couple of weeks during which time the Quinta’s been lucky enough to play host to some far better photographers than I’ll ever be, but these are my offerings; some of them are colourful, some of them not, some of them interesting to the general public, and some of them interesting only to those of us who get a thrill from distinguishing one little brown bird from another! The one above is of course of one of my favourite species, a Red-rumped Swallow. They were picking up nesting material from the petrol station forecourt in Santa Clara, so it was a nice easy shot to make – comfortable too, sitting in the bar with a drink by my elbow! Three-toed-Skink-20090424, originally uploaded by Paradise in Portugal. Above is a Three-toed Skink; yes, I’m quite aware it’s not a bird, but birds are just one part of the wonderful depth of Nature surrounding us here and I revel in it all. Birds are simply, (normally), the most visible. 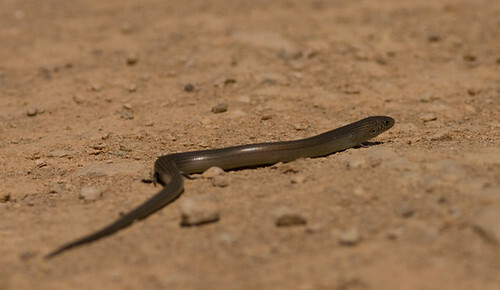 The Three-toed Skink is kind of half way between a lizard and a snake with minute legs that really don’t do that much. It lives most of its life hidden away underground but a couple of weeks ago I found this one out in the open. Ocelated-Lizard-20090506, originally uploaded by Paradise in Portugal. This is a species I’ve been trying to get for YEARS. 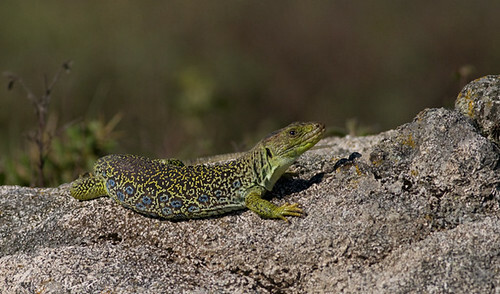 Although they like basking out in the open like any reptile, Ocellated Lizards carry a good deal of meat on them, growing up to nearly a meter in length, and as such are high on the list as food for Short-toed Eagles, so they are wary and can move very fast when they need to. This one I found at the top of Foia at an altitude of 900 meters while looking for Blue Rock Thrushes. 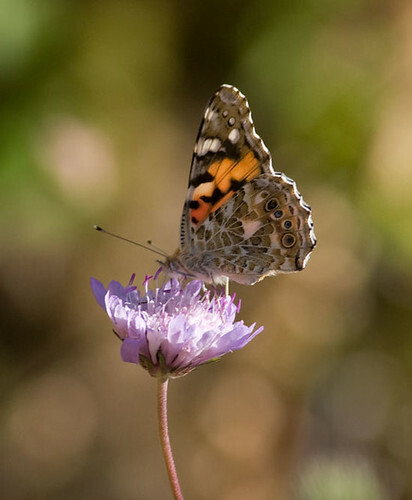 It seemed remarkably un-fazed by a human’s prescence and I was lucky enough to get a few of these wonderful photos. 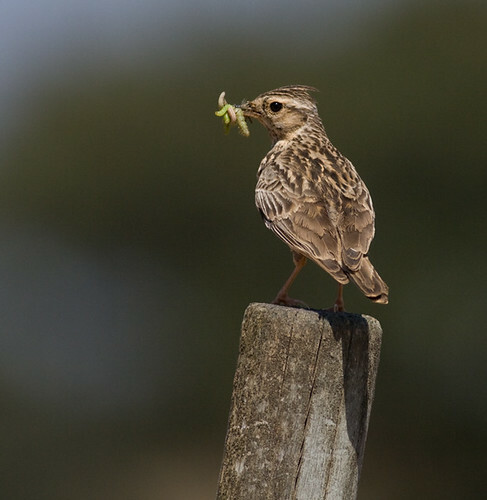 Wood-Lark-20090504, originally uploaded by Paradise in Portugal. Pure luck to have been in the right place at the right time again but this is one of my favourites. Not often that one’s able to get a record this sharp …. I think I’m proudest of this shot than of pretty well any other I’ve taken during the last few months! 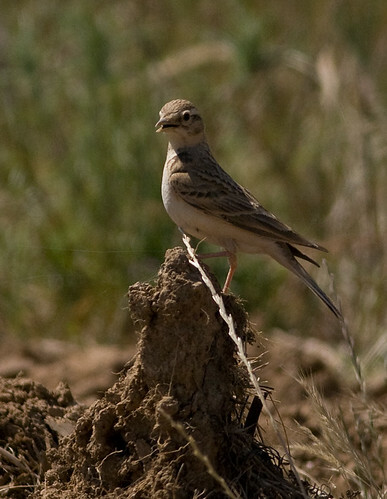 Short-toed-Lark-20090504, originally uploaded by Paradise in Portugal. A rather boring LBJ but one that it’s difficult to find and get a good shot of so I was pleased with this.